Disco fever at Brooklyn Standard! You know what they say: new year, new (very hungover) you! With the biggest party night of the year coming up, it’s time to lock in those NYE plans. At Brooklyn Standard, the ball might drop on 2017, but the disco ball’s set to glitter all night. This December 31, Brisbane’s biggest laneway party is returning with a bang (and a boogie)! Pull on those platform shoes and bust a move all the way to Eagle Lane for Midnight Disco. Taking over the CBD laneway from 6pm, you’ll be thrown back to the days of glow mesh, flared cuffs, and some serious Saturday night fever. #neverforget Reppin’ the 70s dance moves (who doesn’t love a good hustle? ), you’ll party the night away with live DJ tunes in the laneway. Downstairs in Brooklyn Standard, live bands will take the stage all night. Tickets are just $125pp and include 5 hours of drinks to see you into the new year, a live DJ disco, and a serve of American street eats. That’s right: it’s the party you’ve bun waiting for – burgers, brews, and a chance to bust out the robot without judgment. Yeah, resolutions sorted. 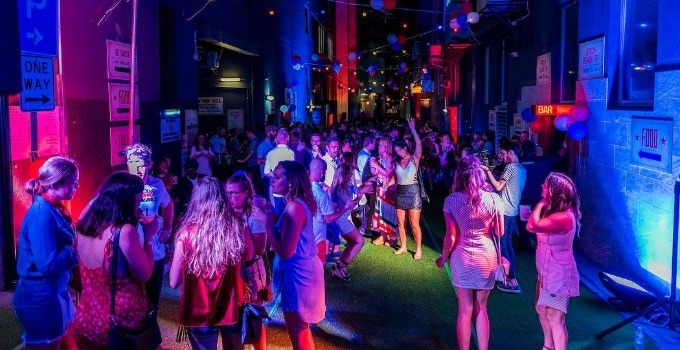 Spots to this laneway bash are bound to sell out fast, so grab yours quickly! Words by Samantha Chariton the gourmand you’ll find cutting a rug on the dance floor, food in hand.